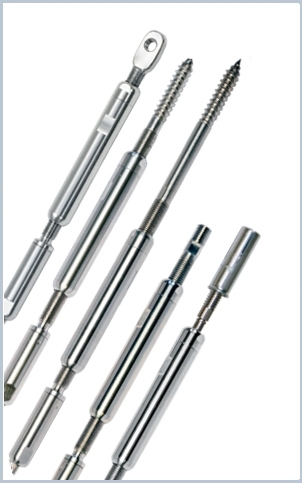 The Push-Lock tensioner for inside-of-post applications..
Push-Lock Turnbuckles are typically used as a second tensioning device on longer runs. They are a combination of our Adjust-a-Body tensioners and Push-Lock Studs, and are available with whatever connecting end is necessary. Whether wood posts, metal posts, sleeved posts, or even concrete; level runs or stairs, the Push-Lock Turnbuckle is our most universal fitting.